To visit current and archived News Releases click here. The City is committed to continuing to reflect resident priorities in our budget decision-making so our local quality of life is maintained, no matter what happens nationally, regionally or with the economy. ...but we can't do that without you. Commercial Cannabis in the City. What Are YOUR Priorities for Moreno Valley?, Fire Department Enhances Life Saving Abilities with New Technology, Free Household Hazardous Waste and Electronic Waste Collection Event, Refine Your Job Search Skills at the Employment Resource Center, City to Make Road Improvements at Grant Street, and the Pet of the Week. Moreno Valley Utility's Electric Reliability Wins National Praise Moreno Valley Utility (MVU) has been recognized nationally for what MoVal customers already appreciate: Our community-owned electric service is amazingly reliable. Southern California-based automaker Karma Automotive today launched its new Moreno Valley-based customization and innovation hub at a ceremony attended by employees, business partners, suppliers, and local government. The Moreno Valley Animal Shelter was awarded a $30,000 grant from the Petco Foundation to support its lifesaving programs to improve outcomes for the community’s companion animals. All public facilities are back to full time schedule and open all non-holiday Fridays. Report a stray or problem animal. Get dog licenses and renew them online. You can search the adoptable pets at the Moreno Valley animal shelter. Get Information about projects and give feedback. Report code violations in the city. See which CSD parcel charges/taxes were levied against your property for the current fiscal year. You can request the Moreno Valley 'M be lit a special color. You can now pay your MV utility bills online. Publish an event on the MVTV-3 Community Bulletin Board and Community Calendar. Our local TV station is available on your computer 24x7. Watch MVTV-3. The City of Moreno Valley’s Emergency Alert and Warning Notification System is utilized to rapidly send notifications to all residents and businesses in an affected area in the event of an emergency or disaster. Residents have an option when registering their information to receive notifications through their landline, cell phone, text message and/or email. Sign up now. Report a crime online using the form. - Report problem intersections and traffic flow using the Traffic Form. - Report a pothole or other roadway surface issues using the Pothole Form. Use this form to report a broken or leaking sprinkler on City maintained property (medians, landscaped areas on arterial streets, open space, and multi-use trails). Online Service Portal View real-time project related information. Get connected and stay informed! A variety of sites to suit your needs. Report street lights that need repair. 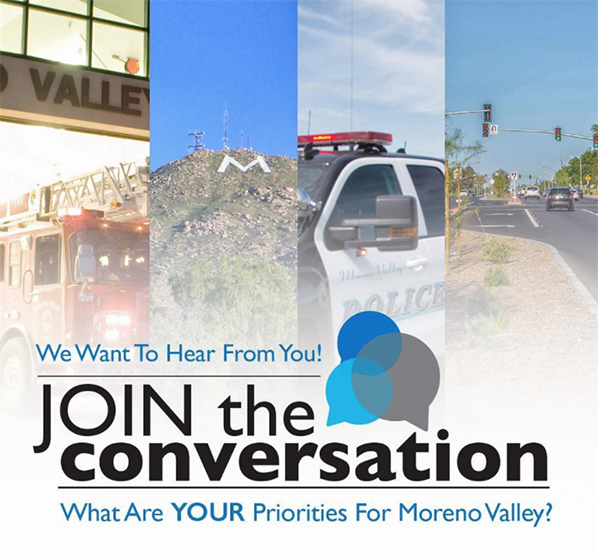 Get the big picture on business and development activities in Moreno Valley. See maps of the City, with GIS info and much more. Visit the online help desk with links to forms, engineering specs and more. Find it with our GIS service. Along with new projects, many of these items are on-going programs. Copyright 1996-2019 City of Moreno Valley, All Rights Reserved.